It may interest you to know that Hitler and the Nazis are making you even more famous by giving you an exhibition in Munich this year. In July 1937, George Grosz received a brief note from abroad telling him of a current display of his works in Germany sponsored by "Hitler and the Nazis. "1 Enclosed was a Paris World-Tribune report on the 19 July unveiling of the Degenerate Art exhibition in Munich. Grosz's art appeared there among the more than 650 paintings, drawings, and sculptures by Wassily Kandinsky, Paul Klee, Wilhelm Lehmbruck, Käthe Kollwitz, Otto Dix, and other leading modernists whose works had been confiscated from German museums and public collections in the preceding weeks. The Degenerate Art show sought to shape viewers' understanding of the works on display through its unveiling in an unorthodox setting for the presentation of art. Staged in an archaeological institute, not a museum, it encouraged visitors to regard the exhibited objects not as works of art but rather as artifacts of a dead culture. Organizers hung paintings haphazardly on temporary partitions and scattered sculptures carelessly around the galleries. Graffiti-like slogans scrawled on the surrounding walls castigated the works on view as "an insult to German womanhood," "deliberate sabotage of national defense," "crazy at any price," and "nature as seen by sick minds." The Degenerate Art spectacle brought to political account Hitler's long-standing negative judgment on modernist art, which he condemned as "spiritual madness" in his autobiographical manifesto Mein Kampf (My Struggle) of 1925. For the Nazi leader and others who shared his views, the formal experiment and challenging contents of modernist art were complicit in modernizing social and political changes they held responsible for Weimar Germany's alleged cultural and spiritual decline. Hitler furthermore insisted that it was the task of a strong leadership to protect the people from modernism's deleterious effects: "It is the business of the state, in other words, of its leaders, to prevent a people from being driven into the arms of spiritual madness. And this is where such a development would some day inevitably end. For on the day when this type of art really corresponded to the general view of things, one of the gravest transformations of humanity would have occurred: the regressive development of the human mind would have begun and the end would scarcely be conceivable. "2 Under Hitler, the Third Reich assumed this responsibility of cultural leadership. With the staging of the Degenerate Art exhibition it also made plain the regime's plan to expunge modernist art from the nation's cultural patrimony. Several outstanding studies have examined the Degenerate Art exhibition, its role in Nazi cultural policy, and its impact on the lives and livelihoods of modernist artists living in Germany.3 The following pages focus instead on responses to the Degenerate Art show in the United States, with specific attention to how reports of the exhibit prompted a turning point in Grosz's reputation as a famed exile from the Third Reich. Before 1937, John Dos Passos, Marsden Hartley, and other American commentators had acclaimed Grosz as a victim of political persecution; in the wake of Degenerate Art, however, his fate also took on an aesthetic dimension. As we shall explore, Grosz and his work now became entwined with the plight of an artistic modernism faced with vilification and expulsion from the Hitler regime. This chapter addresses the evolving nature of Grosz's exile experience as the enormity of events unfolding in Germany began to command world attention. Like Thomas Mann, Albert Einstein, and other exiled artists and intellectuals, Grosz confronted the changing expectations of an American public increasingly alarmed by Hitler's threat. Under the circumstances, he and others of the emigration became evermore intimately identified with their country of origin as observers and critics, and they themselves probed for insight into the country responsible for Nazism. The Exile of George Grosz examines the life and work of George Grosz after he fled Nazi Germany in 1933 and sought to re-establish his artistic career under changed circumstances in New York. It situates Grosz’s American production specifically within the cultural politics of German exile in the United States during World War II and the Cold War. Basing her study on extensive archival research and using theories of exile, migrancy, and cosmopolitanism, McCloskey explores how Grosz’s art illuminates the changing cultural politics of exile. She also foregrounds the terms on which German exile helped to define both the limits and possibilities of American visions of a one world order under U.S. leadership that emerged during this period. This book presents Grosz’s work in relation to that of other prominent figures of the German emigration, including Thomas Mann and Bertolt Brecht, as the exile community agonized over its measure of responsibility for the Nazi atrocity German culture had become and debated what Germany’s postwar future should be. Important too at this time were Grosz’s interactions with the American art world. His historical allegories, self-portraits, and other works are analyzed as confrontational responses to the New York art world’s consolidating consensus around Surrealism and Abstract Expressionism during and after World War II. 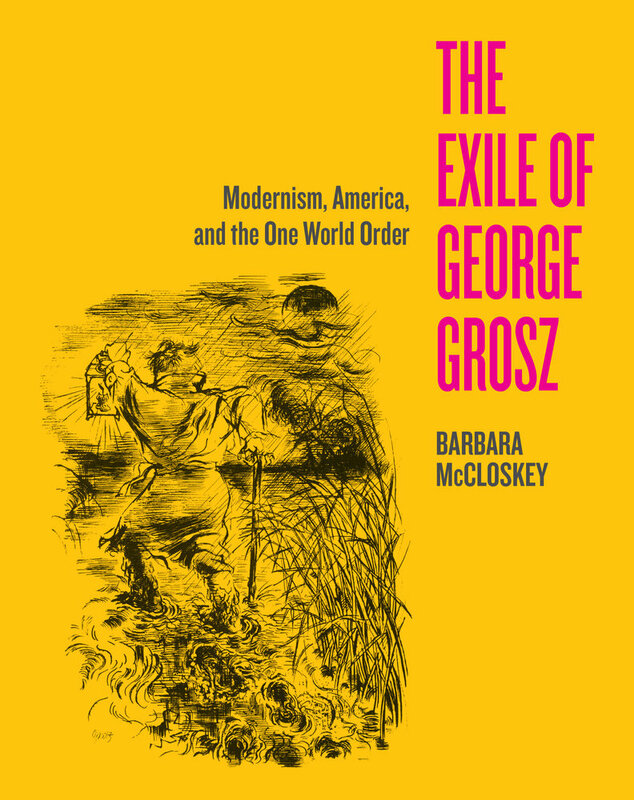 This nuanced study recounts the controversial repatriation of Grosz’s work, and the exile culture of which it was a part, to a German nation perilously divided between East and West in the Cold War. Barbara McCloskey is Department Chair and Associate Professor of Modern German Art at the University of Pittsburgh. She has published widely on the relationship between art and politics in German twentieth-century art, the visual culture of World War II, and artistic mediations of the experience of exile in the modern and contemporary eras. Her previous books include Artists of World War II and George Grosz and the Communist Party: Art and Radicalism in Crisis, 1918 to 1936.